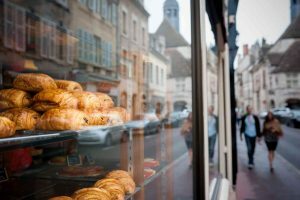 Every day, the buttery fragrance of sweet pastry dough rises with the morning sun in France. While tourists and locals sleep, the bakers and pastry chefs are hard at work beating eggs and measuring flour for the morning rush. From sweet to subtle, flakey to gooey; French pastries are an artform all its own. How many of these delicacies have you enjoyed lately? The croissant is an airy, flaky, buttery delight. You can find it filled with chocolate, almond cream, or fruit, but the plain croissant makes a statement alone. Essentially a small mountain of butter folded into the dough, the croissant has remained supreme for centuries. An éclair is a long, thin choux pastry filled with a pastry cream and then finished with a chocolate icing. The classic presentation is chocolate icing with vanilla-based filling, but bakers have played with the recipe since its creation, ranging from incorporating coffee and caramel flavors into the heavenly mix. “Though she be but little, she is fierce.” These tiny treats are as delicious as they are attractive. Simply put, macarons are a meringue-like cookie made with ground nuts, then sandwiched together with cream or ganache. These petite gems are flavored and colored to the consumer’s delight, ranging from green pistachio to pink strawberry. The American pineapple upside-down cake’s distant relative, Tarte Tatin is a French apple tart that is baked and then flipped before serving. This method allows for the warm butter and sugar to drip onto the apples, merging the ingredients together to form a cohesive and inspiring dessert. It looks like a large donut sandwich, and that’s because it basically is. This donut-shaped choux pastry is split in the middle and filled with rich, flavorful pastry cream. Originally inspired by a bicycle race by the same name, the Paris-Brest will give you a sugar rush large enough to get you through any day. Experience an exhilarating French adventure on the Cosmopolitan, Explorer, and Continental tours. It’s never too late to get a taste of a multitude of exciting cultures! This entry was posted on Thursday, February 16th, 2017	at 11:22 am	. You can follow any responses to this entry through the RSS 2.0	feed. Both comments and pings are currently closed.